"Through comparisons between humans and macaque monkeys, my lab previously showed that many of these high-growth regions are expanded in humans as a result of recent evolutionary changes that made the human brain much larger than that of any other primate," says David Van Essen, PhD, Edison Professor and head of the Washington University School of Medicine Department of Anatomy and Neurobiology. "The correlation isn't perfect, but it's much too good to put down to chance." The high-growth regions are areas linked to advanced mental functions such as language, reasoning, and what Van Essen calls "the abilities that make us uniquely human." He speculates that the full physical growth of these regions may be delayed somewhat to allow them to be shaped by early life experiences. The scientists found that the human brain regions that grow the most during infancy and childhood are nearly identical to the brain regions with the most changes when human brains are compared to those of apes and monkeys. "Pre-term births have been rising in recent years, and now 12 percent of all babies in the United States are born prematurely," says Terrie Inder, MD, PhD, professor of pediatrics. "Until now, though, we were very limited in our ability to study how premature birth affects brain development because we had so little data on what normal brain development looks like." Among the questions Inder and her colleagues hope to answer is the extent to which the brain can adapt to developmental limitations or setbacks imposed by early birth. They are also helping to develop clinical strategies to promote such adaptations and normalize development. The study used a technique for comparative brain anatomy called surface reconstruction pioneered by senior author David Van Essen, PhD, Edison Professor and head of the Department of Anatomy and Neurobiology. Surface reconstruction helps scientists more closely align comparable regions and structures in many different brains and has been used to create online atlases of brain structure. Jason Hill, an MD/PhD student, analyzed the brain scans of 12 full-term infants and compared these to scans from 12 healthy young adults. Data from the two groups were combined into a single atlas to help scientists quantify the differences between the infant and young-adult brains. They found that the cerebral cortex, the wrinkled area on the surface of the brain responsible for higher mental functions, grows in an uneven fashion. Every region expands as the brain matures, but one-quarter to one-third of the cortex expands approximately twice as much as other cortical areas during normal development. Inder notes another potential explanation for the different development rates: the limitations on brain size imposed by the need to pass through the mother's pelvis at birth may force the brain to prioritize. "Vision, for example, is a brain area that is important at birth so an infant can nurse and learn to recognize his or her parents," Inder says. "Other areas of the brain, less important very early in life, may be the regions that see greater growth as the child matures." Researchers are currently conducting similar scans of premature babies at birth and years later. "This study and the data that we're gathering now could provide us with very powerful tools for understanding what goes wrong structurally in a wide range of childhood disorders, from the aftereffects of premature birth to conditions like autism, attention-deficit disorder or reading disabilities," Inder says. 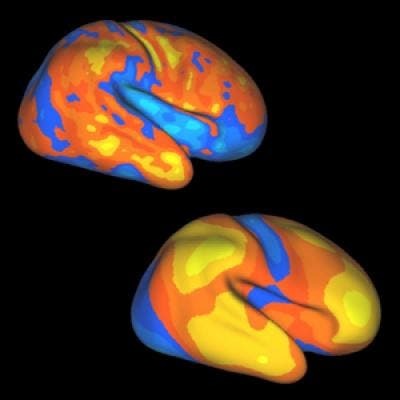 Image: Areas of expansion in the human cortex during infancy and childhood, top, closely match areas of change in the human brain when compared to the brains of apes and monkeys. Yellow areas expanded the most, followed by orange, red, blue and light blue areas. Credit: Washington University School of Medicine in St. Louis.